Casey Williams is a senior at Duke University studying literature. He has been working on responsible investing projects for several years and currently serves on Duke's Advisory Committee on Investment Responsibility. 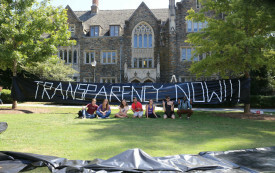 The success of DukeOpen’s campaign to pressure the university’s board of trustees to reform guidelines on investment responsibility demonstrates the importance of understanding the system you’re trying to change.